Trampolines give us the unique opportunity to feel the rush of briefly flying through the air with the fun of the bounce when you land. 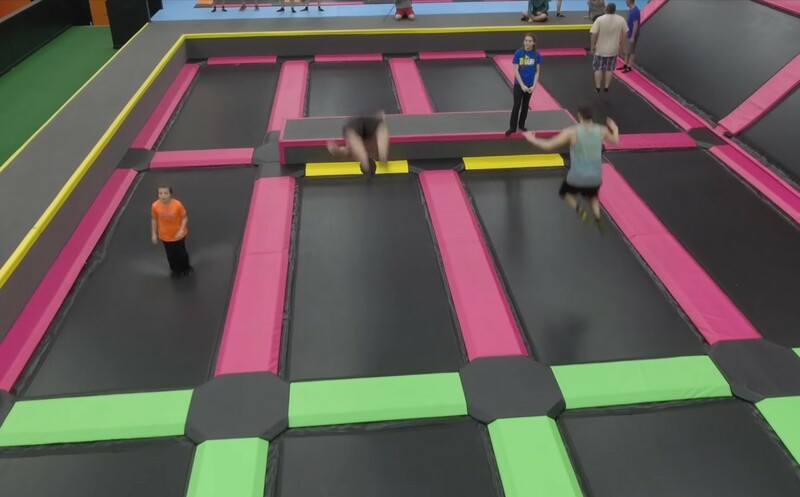 Top Jump Trampoline Park in Pigeon Forge takes that experience to its limits with numerous areas to jump to your heart’s content, and a variety of other attractions and features that make for a fun family excursion. If you want to bounce the day away in a unique and safe environment, Top Jump Trampoline Park is the answer you’ve been waiting for. The trampoline park room is truly expansive, and it’s filled with a variety of trampolines and more. There is a giant air bag for you to live out your craziest skydiving fantasies, a trampoline basketball court, and a dodge-ball area where you can partake in organized games. Lest you think you have to structure your jumping, have no fear. You are welcome to just enjoy the free jump area while bouncing, somersaulting, and twisting your way around. There’s enough to do for you to customize your trampoline experience however you see fit. Ready to test your skill at jumping obstacles? Then make your way over to the trampoline ninja course. You might even get a chance to see how you fare on some obstacles you’ve seen on TV. Top Jump even has a kid zone that is reserved only for jumpers under 42 inches. As for parents, you might not be able to pass up the opportunity to soar through the air on the trampolines yourself, but if you want to sit out that’s okay. There’s a viewing area where you can sit and relax while keeping an eye on the entire park. If you aren’t content with defying gravity on the trampolines, then you might want to check out the Clip ’N Climb climbing center. People of all climbing skill levels are encouraged to try their hands at the various activities there, and there are multiple levels to accommodate any type of climber. The Clip ’N Climb structure was inspired by a climbing center in New Zealand, and Top Jump’s is the largest such center in the united States. The jumping and climbing get most of the attention, but there are several other fun activities available at Top Jump. For instance, it features the comprehensive Sugar Rush candy store filled with almost every type of confection imaginable. There’s no doubt that a sweet treat will sound pretty good after a day of bouncing. Top Jump is also home to a 5,000-square foot arcade with a mix of new and classic games. They also can accommodate parties and group events if you are looking to organize an outing. With great trampoline facilities and a variety of activities for the family, Top Jump Trampoline Park will make a worthy excursion during your next Smoky Mountains vacation. Keep in mind that Top Jump does limit the number of jumpers and climbers at a given time, but you can schedule sessions and buy tickets in advance through the Top Jump website.